This book is so many things. It is a very personal memoir. It is part travelogue. It is a cookbook. It is an inspirational text for those suffering from depression. It might seem as though it would be impossible for any book to succeed at being all these things and yet The Measure of my Powers does. As a memoir, we are led into both the dark and light corners of the author’s life. 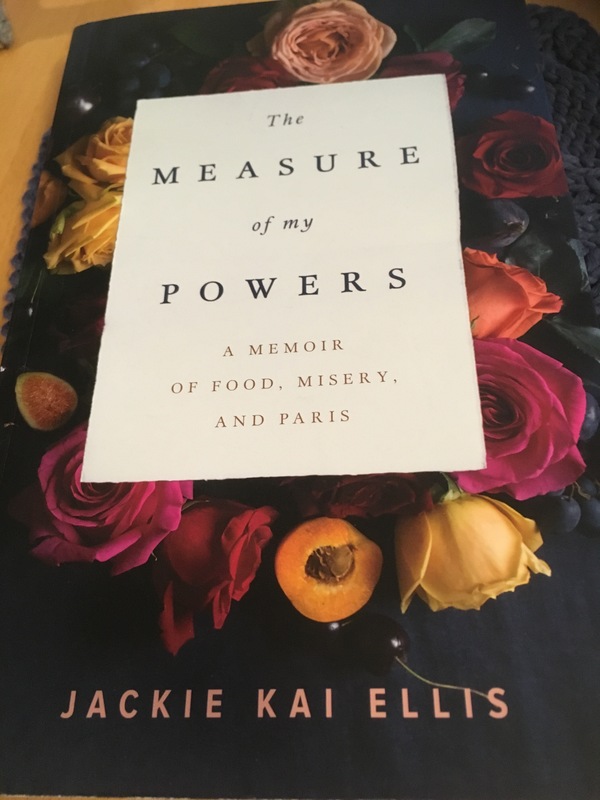 When Kai Ellis describes her grandmother cooking, I can imagine myself making dumplings – we’ll see how that works out when I try the recipe for pork and chive dumplings included in this chapter. The travelogue takes us on a camping trip on the northern British Columbia coast – a road trip with her family including the foraging that came so naturally to her parents. There is also a terrifying journey in the Democratic Republic of Congo, complete with a vignette of the author almost being kidnapped. Most of all, though, there is Paris, woven throughout all parts of the narrative like the beacon of light it so often is. As for an aid to help manage the desolation of depression, even when she is describing her worst moments, Kai Ellis hints at the recovery she has made. Someone suffering similarly might read how she picked something that would make her smile – a chocolate chip cookie – and then ate one mindfully every day. In speaking of the cookbook and recipes last, I will say that the recipes in this book, which are a leitmotif for the themes of the chapters, are written exactly as I like recipes to be written. There is some information about their meaning for the author. There are details about the ingredients. Finally, most important to me, there are exact instructions about how to make each part of the recipe. You come to understand the food you are making when you prepare one of Kai Ellis’ recipes. Wonderful review. Thank you, and I’m will no doubt enjoy the recipes.